Adjunct education professor William Eggl demonstrates new techniques for teaching algebra. 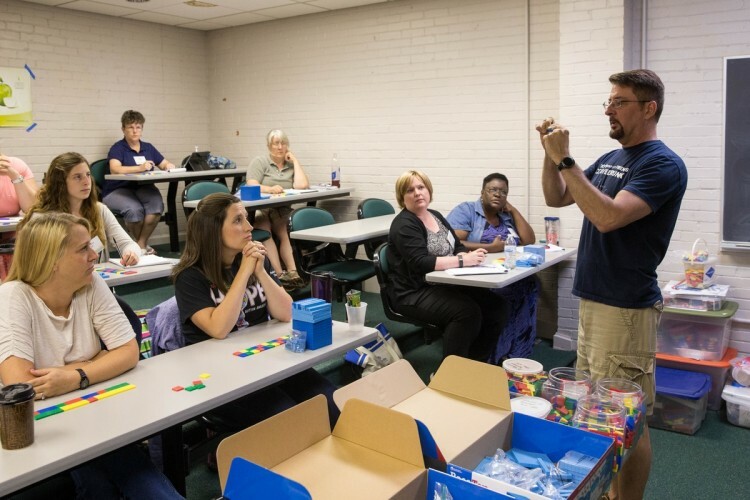 Eggl was one of several Randolph faculty members sharing new instructional techniques this week at the College’s seventh “Teaching Math and Science in a Changing World” institute for 65 local elementary and middle school teachers. The popular, week-long workshop is funded by a grant from the State Council of Higher Education for Virginia (SCHEV). Participants in Randolph’s teaching institute work together to build a structure that would be tested on the shake table. This year, the institute was also the subject of a Summer Research project for Randolph students Danish Roshan ’18, Gavin Cook ’18, and Drucilla Williams ’18. The trio worked with Sheldon and Rumore, as well as education professor Peggy Schimmoeller, to prepare presentations, lessons, and activities for each session. For one session, the students used plywood and springs to create earthquake simulators called shake tables. At the institute, teachers were challenged to build structures out of Styrofoam that would be sturdy enough to withstand the simulation. 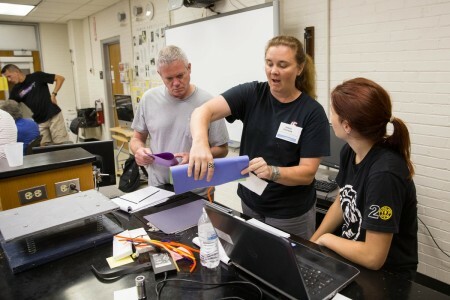 In addition to the hands-on component of their project, the students are compiling data from previous teaching institutes to examine its effect on teachers and their students. They’re planning to write and publish an article about the effectiveness of a roller coaster activity designed at a previous institute in the National Science Teachers Association’s academic journal. A fellow physics major, Cook is considering a teaching career and is gaining insight from the experience. 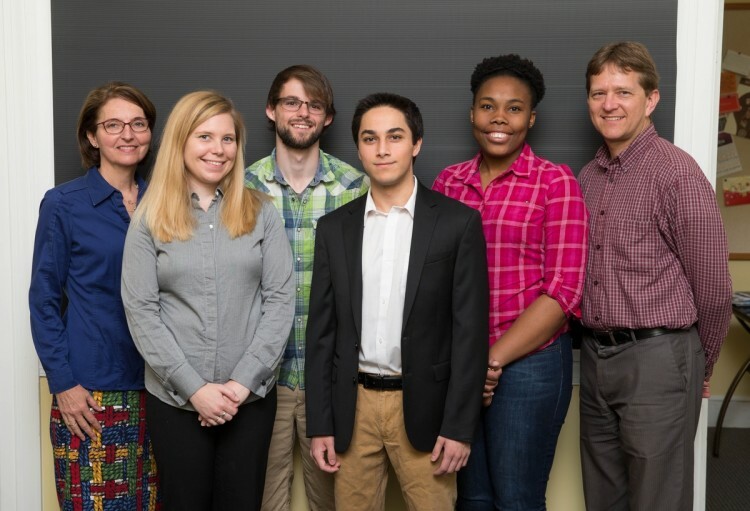 (From left) education professor Peggy Schimmoeller, biology professor Amanda Rumore, Gavin Cook ’18, Danish Roshan ’18, Drucilla Williams ’18, and physics professor Peter Sheldon.